Christmas is fast approaching, and you probably haven’t checked off all the names on your list yet. The good news is that we’re here to help! Keep reading for some great suggestions from our guest Bill Atkins, Co-Founder of Stylebook, in Part II, which continues below. 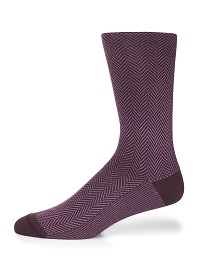 Every man needs socks, so why not gift him a pair or a few? With designs ranging from traditional patterns like argyle and houndstooth to festive themes such as snowflakes and reindeer, our socks will most certainly be appreciated by your recipient. 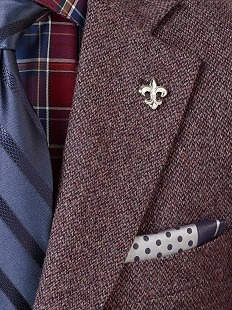 It is often said that it is the finishing touches which truly make an outfit, and such is the case with our lapel pins. Tack this dapper accessory on to a suit jacket or sport coat and expect compliments. Up the style ante by gifting a pocket square too! Whether he wears one every day or reserves them just for special occasions, a man should have a variety of ties in his wardrobe. 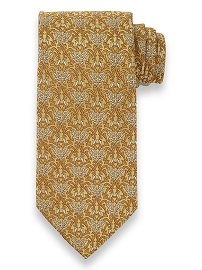 Get him his future favorite from our diverse collection of business dress and business casual appropriate ties. No matter his style, you’re sure to find a design he’ll love. 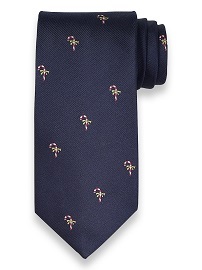 Our luxury 7-Fold Ties handmade in Italy make for an especially unique and treasured gift. French cuff shirts provide their wearer with the biggest opportunity to personalize his style, and our cufflinks are the perfect complement to any outfit. 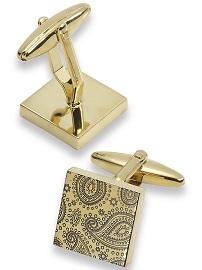 Does your gift recipient prefer gold or silver? Does he stick to the classics or enjoy experimenting with nontraditional accessories? We carry all of the above! 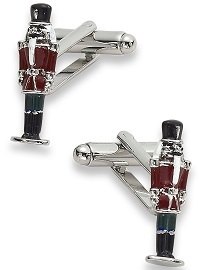 Their elegant presentation also make cufflinks a wonderful present to give. Finding the right gift can become exponentially more difficult when dealing with sized items if you aren’t sure of the giftee’s exact size. Thankfully, scarves are one size fits all. 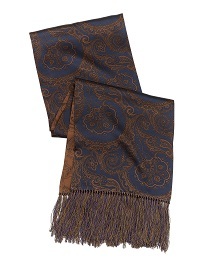 Help a special man in your life stay warm and look smart with the gift of one of our very fine scarves. 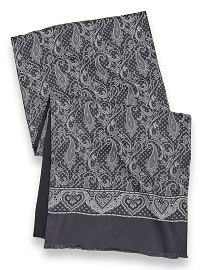 The scarves are reversible, meaning they can be worn to show off the patterned silk side or the solid wool side. The 100% silk style is patterned on both sides and decorated with tasseled fringe, so you’re guaranteed to look great either way. 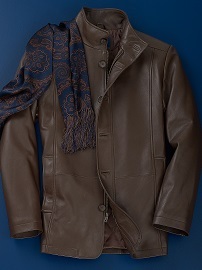 If you do know the gift recipient’s size, we highly recommend that you take a look at our supersoft leather jackets. Timeless, elegant, and inherently cool, leather jackets are the ultimate gift. Made from the highest quality New Zealand lambskin, ours are the perfect weight for multi-season wear and can be worn as outerwear or as a relaxed sport coat. Careful, though… When you see it, you’ll likely want to keep it for yourself! The Apple Watch is a great tool to track your activity, communicate with friends and easily make payments without taking your wallet out. It’s a great way to see notifications without taking out your phone and getting absorbed in it. The most expensive versions of the Apple Watch have the same features as the cheapest, so I went with the entry-level Sport. The band is interchangeable, so I can always upgrade bands later if I want. These Bluetooth earphones are great for working out, and won’t fall out even on a run. Citizen’s folding bikes are much more affordable than their competitors. They look great, and fold and unfold easily. I use mine to commute to the office without having to worry about finding an available bike rack when I get there. With this system, you just install smart bulbs in any light socket in your house. The bulbs can then be dimmed, turned on and turned off with your smartphone, or programmed to turn on and off at specific times. There’s no need for special wiring or special light fixtures. We hope this guide has given you some ideas for those still on your list. Special thanks to Bill Atkins for his contributions! See more gift recommendations here.